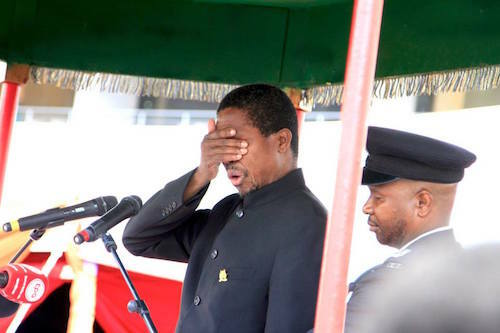 Dictator Edgar Lungu has warned the Zambian judiciary that he has information that some Judges are trying to copy what happened in Kenya and stressed that he will not allow them. Speaking on arrival in Solwezi today, Lungu accused people he did not name of trying to force regime change in Zambia so that they manage the country the way they did before Zambia gained independence. ‘They want regime change so that they manage us the way they managed us during colonial days, that I will not allow,’ Lungu hallucinated. He warned the judiciary that they should not think they will be heroes by copying what happened in Kenya where the Supreme Court nullified elections adding that they will only plunge the country in chaos. ‘To my colleagues in the judiciary my message is just do your work and look at the best interest for Zambia, don’t become a copycat and think that you will be a hero, you will plunge this country into chaos,’ Lungu said. He said people who don’t love peace and freedom will accuse him of intimidating the courts of law and claimed that he was not intimidating them but merely warning them that he has information that some of them want to be adventurous. ‘I have information that some of you want to be adventurous, your adventure should not plunge us into chaos please just because of trying to imitate what is happening somewhere (Kenya),’ Lungu warned. Lungu further claimed that Zambia has been a beacon of peace, freedom, justice and liberty and that it should continue that way. Lungu is not comfortable with the judiciary after the Judicial Complaints Commission ruled that the presidential petition filed by the UPND last year was heard in 10 days instead of the constitutional 14 days.